Here’s Elvis trying on the cape, the batwings and the wide belts in Las Vegas in 1970. There must have been a lot of material in that original white outfit because it was certainly let out a lot as the Seventies progressed. But not here, this is Elvis at his sleekest, only two years after his famous 1968 comeback special, when he proved he was one of the few people in the world who could wear top-to-toe black leather and not look like a gimp. This “special edition” is a recut of the original film, there’s a lot more goofing about, more pre-show rehearsal with the band (watch James Burton on guitar and be amazed at how good he is) and more of Elvis fluffing and corpsing on stage. It’s a more human Elvis perhaps, or maybe just a demonstration of the fact that when you’ve got this much charisma it doesn’t matter what you do. 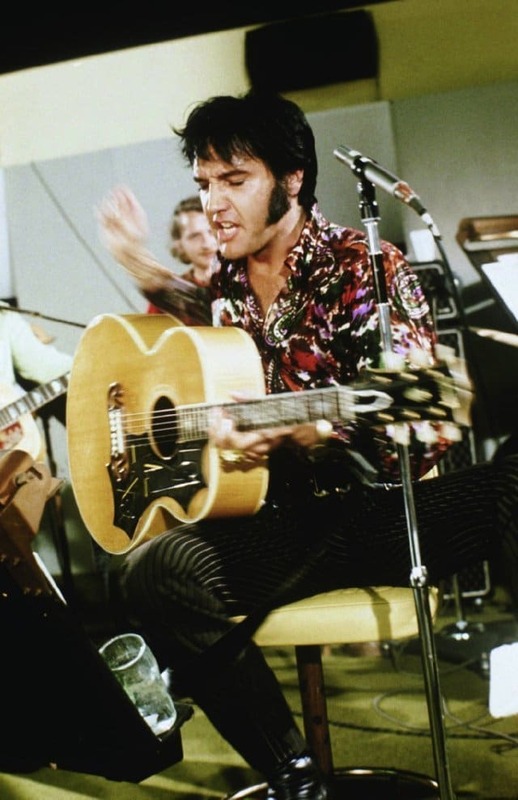 And that’s the film – rehearsal with band and backing singers, interviews with fans, shots of celebrities such as Cary Grant and Sammy Davis Jr arriving for the show, the show itself (a handful of shows, actually, though all from early August 1970), plus Elvis just hanging about, waiting to go on. In every sense this is Elvis poised on the brink, between thin Elvis and fat Elvis, the rocker and the lounge singer. And it’s fascinating to watch him trying to reclaim his crown – long, long gone though no one in Elvis’s retinue was going to say that. Though, to be honest, when Elvis is singing “I Just Can’t Help Believing” and the lights come right down and the big band takes its foot off the pedal, the rest of the world and all the new emperors of popular music might as well have disappeared. Trivia: Concert footage and backstage documentary of singer Elvis Presley. Storyline Concert footage and backstage documentary of singer Elvis Presley.